Thanks to my friend and co-conspirator Petri Krohn, this old site has been getting new views. The research was not deep, but I just wanted to lay out some of what what I didn't like about this stuff. 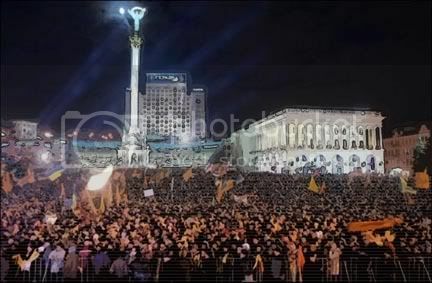 I also haven't kept up much on events in Ukraine or Georia or the rest since writing in 2004-2007 The idea of regime change by protests has gone through some twists and turns so worth covering I just don't feel up to yet, and there are so many mini-lies to correct... In Libya and Syria both I've tackled some lies, increasingly with a network of friends starting with Petri, usually with more detail and intellectual force than any other source, sometimes by a long shot. Obviously the Ukraine situation makes the topic of this old site more relevant like few other events. Although what happened in Kiev a week ago was not non-violent by any measure, but the guerillas had relatively few guns, its public perception is more in line than reality is with the image of a peaceful peoples' revolt, and in all other ways it's relevant to cover here. But it may not be covered here, by me. I will direct readers to a dedicated page at A Closer Look On Syria (ACLOS) Talk:Ukraine 2014 and a discussion at the Randi educational forum where a reader following my posts (Caustic Logic) and fellow ACLOS member CE (Childlike Empress) can learnm much. Already we have a collection of evidence, needing assembled and checked more, that's nearing proof of an engineered false-flag sniper event, plus an undeclared assault by Romper-Stomper Nazi thugs (displaying almost none of their symbols this time) on Ukraine's democratic government. The details remain unclear, but few over here seem to care as a mysteriously truncated parliament is rushing through a spate of radical measures: cementing their own power and the appearance of gain for their Western supporters, and in ridiculous ways framing and illegalizing the previous government, whose members and supporters seem slated for unexplained "lustration," trial at the ICC or other kangaroo court, or assassination. I have removed comment moderation, an anti-spam measure set long ago. I imagine there were pending comments, but after changing settings, it said none. So I hope I didn't delete anyone's thoughts. I may not keep up closely, but this platform is again open for comment activity. It's also quite possible I will post some of our important findings here or in related posts.